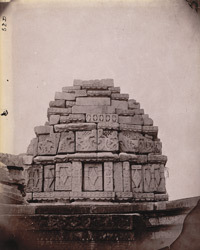 Photograph of part of the roof of the ruined temple at Rahilya, Hamirpur District, taken by Joseph David Beglar in 1871-72. In the North-Western Provinces List of 1891 the place is described, "About three miles S.-W. of Mahoba lies the village of Rahilya, with a small tank, on the embankment of which stands a ruined large Chandella temple built in the form of a cross. The dome of the central hall has fallen, but the walls and cross lintels are still standings. The tank and temple were probably constructed by Rahilavarman (A.D. 875-900)." The temple is not decorated with detailed ornamentation because it is built from granite, a hard stone which is difficult to sculpt.